4Easysoft Mac TS to MP3 Converter is currently the most convenient TS to MP3 Mac program running on Mac OS X which can convert TS (TS stands for Transport stream) to MP3 for Mac and convert between audios with super fast speed and great output quality! Most of the popular video and audio formats input are supported, such as MPG, VOB, MP4, M4V, TS, WMV, AVI, 3GP, FLV, HD TS, HD MPG, HD WMV, QuickTime HD MOV, HD H.264, etc video and MP3, MP2, AAC, AC3, WAV, WMA, M4A, audio. 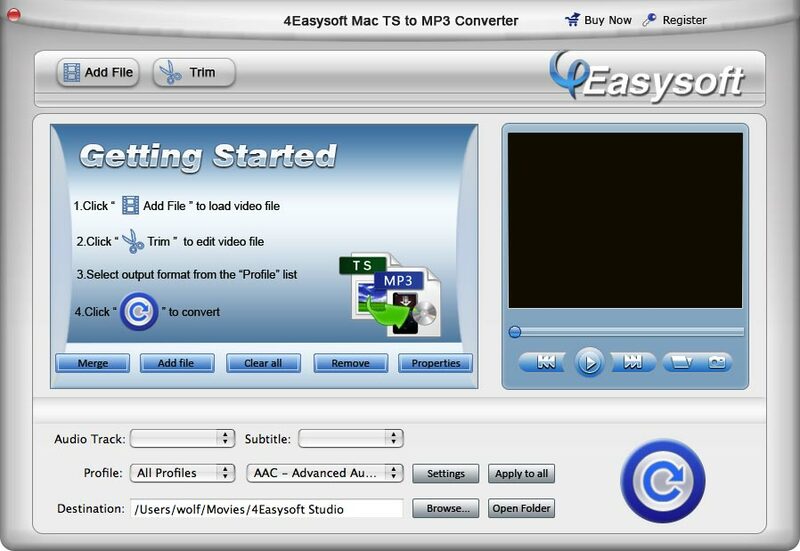 Besides, 4Easysoft Mac TS to MP3 Converter provides some extra editing functions to colorize the output files and also functions as music cutter and joiner: capture favorite clips from input files, join the selected files into one, input watermark the way you like, adjust the output settings. Try this TS to MP3 converter for Mac now! The trim function allows you to get a specific length of MP3 segment from TS accurately since its inner seek function can capture any key clips of the input file. You can join multiple files into one bigger file for conversion, so you can listen the output files without interruption. The watermark allows you to set the video Brightness, Contrast, Saturation by adding pictures, texts or images, etc. Select the proper subtitle and audio track to quicken the process. You can customize the encoding settings as your own profile and click the Save as... button to save in the User Defined list. After importing the video files, you can preview them instantly. It also works as a common player. Snapshot the current picture when previewing and save it as GIF, JPG, or BMP format. The intuitive interface of 4Easysoft Mac TS to MP3 Converter provides you the easiest to understand options, with which you can use the TS to MP3 Mac as an expert. Its optimized technology allows you to convert TS and other videos to MP3 on Mac in a faster way, saving you nearly half time. It is available for you to add your favorite watermark. Provide a way to choose your needed audio track and subtitle.